India’s houses has a rich culture, history and heritage that has embedded a mark on the world. India’s precious history is just not restricted to its magnificent monuments and architectural designs. India has also marked a great place in world of Fashion. It is known for its rich, varied uniqueness of textiles and handlooms. India’s love for minute details and colours is legendary in the global market. Indian handlooms carry prestigious heritage with thousands of talented craftsmen working from every part of country, drawing their imagination on the fabric. Inspired by nature, architectural designs, geometric patterns, forts, rural life and vibrant colour schemes, these artisans are the true painters of the art. India has introduced to the world various precious prints and fabrics and has been monumental in changing the face of fashion. 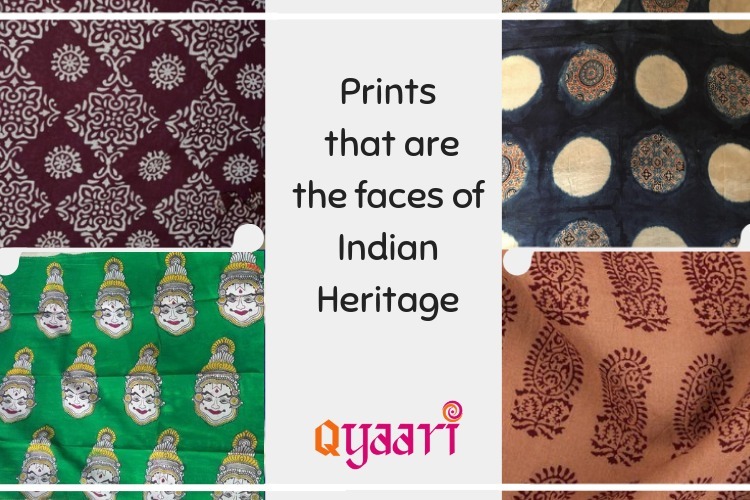 Let’s explore the top 5 prints who portray the face of India. Ikat is one of the oldest forms of textile techniques in India, though the exact location of origin of this technique is unknown in the Indian sub-continent. It is a dyeing technique used to pattern textiles that employs resist dyeing on the yarn prior to dyeing and weaving fabric. The “blurriness” in the ikat textiles is the main characteristic of this technique. It needs a very skilled craftsmen and craftsmanship to create pattern on the perfectly finished cloth. Kalamkari is an ancient Indian art form originated 3000 years at Kalahsti (Chennai) and Masulipatnam (Hydrebad). Kalamkari is mixture of two words – Kalam means Pen and Kari mean work. The ancient artists used bamboo or date palm stick pointed and hair at one end that acted as the brush or pen. It was performed earlier only on cotton fabrics, but soon expanded on silk fabrics. The art depicted was majorly consisting of the Indian mythology scenes, deities and characters. The colours used where made of natural colours from natural extracts. With time, the art has modified into the drawings of flowers, fruits and other natural objects. Ajrakh is the art of block printing on the cloth to create patterns. Ajrakh art can be traced back to the civilizations in Indus valley dated around 2500 BC-1500 BC. The name Ajrakh is derived from Arabic word “Azark” meaning ‘Indigo’. As indigo forms the major colour in Ajrakh printing, this art form is practiced in India in Kutch in Gujarat and Bamner in Rajasthan. Ajrakh print is a repetitive print pattern of web-like design or the central jaal. Apart from jaal design the borders are also added in the ajrakh print. Dabu Print is also known as mud- resist printing. Its origin can be traced in 675 A.D. and is now practised in Akola village of Chittorgarh district of Rajasthan. It uses naturally available mud in the area covered on a wooden block to print these patterns. The prints are popularly adorned on the flowing ghagras & skirts. Bagh print is an art of block printing with natural colours. It actually started when the craftsmen migrated from Manawar in 1962 to Bagh, Dhar District in Madhya Pradesh, India. Hence the name of the print. It is a hand block printing creating patterns on fabric with are carved on the motifs. The major designs include the flora of the area consisting of jasmine, Mogra and Lehriya, etc.